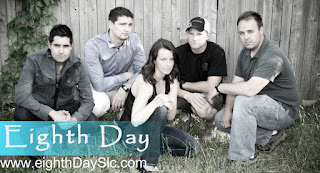 Eighth Day: New Revamped Electronic Press Kit! (EPK) New website, new releases coming up! New Revamped Electronic Press Kit! (EPK) New website, new releases coming up! 2. Connect with fans. We want fans to engage with band, and to follow us on social media. Initially, we treated these two goals as mutually exclusive. We thought that most of our shows that we book would be for cover songs, and that connecting with fans would be for our original content. So we created two websites. We have just decided to consolidate to one website that focused on our EPK. We created this blog to help keep fans engaged with the latest news, and we featured lots of links on our website to help direct fans to our social media. While a lot of my work in my Computer Science degree has been involved in complicated algorithms, complex code, probability, and statistics, part of it has been simple HTML coding. I've been blessed to have the analytical and creative side of my brain working, and I was able to create a simple but attractive and intuitive website. (The joke is that many coders make awful interfaces.) We've pretty much finished our website. We chose to record live in the studio opposed to going into the garage and video taping us raw with a video camera. In the studio, we will have access to an experienced sound engineer who can make sure the mix sounds good, and really give us a distinguished quality recording. We'll be recording at Full Fidelity Studios, working with Steve. We've been working with Steve with our full length album. Steve has been a pleasure to work with, and his work is amazing. He's worked on similar projects with other bands, and the live recordings almost sound like professional studio tracks. We'll also be taking some professional pictures, in part to get some group photos with our new bassist Mark.